The MIZANI Thermasmooth Smooth Guard Serum and Shine Extend Anti-humidity Spritz are part of the four step straightening system, designed to repair, protect and smooth the hair without a chemical commitment. This system is ideal for natural, curly, relaxed or colour treated hair, and great for those transitioning or to extend the time between relaxers and is said to last two weeks. As I did not get the opportunity to try the shampoo and conditioner, I will be commenting on these as individual products and not the system as a whole. MIZANI uses an exclusive C3 smoothing complex, which just stands for Coconut Oil, Ceramides (natural lipids found in sustaining healthy skin) and Cationic Polymers (aids in smoothing the hair shaft) to provide weightless protection for long lasting frizz free smooth styling. The Smooth Guard Serum is a lightweight leave-in, thermal protecting product that helps prevent heat damage from styling tools, but it also nourish and lightly moisturise as it penetrates the hair. I used this product prior to blow drying my hair as a form of heat protection. I enjoyed using it because it has a light scent and texture, it didn't weigh my hair down but did moisturise it lightly. However, I wouldn't rely solely on it to hydrate my hair, more for protecting it from the onslaught of my hair dryer and to add sheen. The Anti-humidity Spritz leaves a high shine finish, it polishes and locks in shine, whilst shielding the hair to resist humidity. It also provides lightweight hold whilst conditioning and protecting against thermal stress. I didn’t get on with this as much, I spritz it onto dry hair, thinking it would boost shine, but I noticed that if I sprayed it too close it would cause my hair to frizz. Once I got the hang of using it, I was able to prevent this. MIZANI do recommend using Tourmaline Technology Straighteners after this step, but as I wasn’t using the whole system and rarely use straighteners on my natural hair, I didn’t. I am sure this could have solved the frizzy issues if I had. I think if you’re someone who likes to straighten their natural hair, is transitioning or wants to extend the period between relaxers then this system as a whole is something to look into. However if you are curly girl you can still consider using the serum alone. 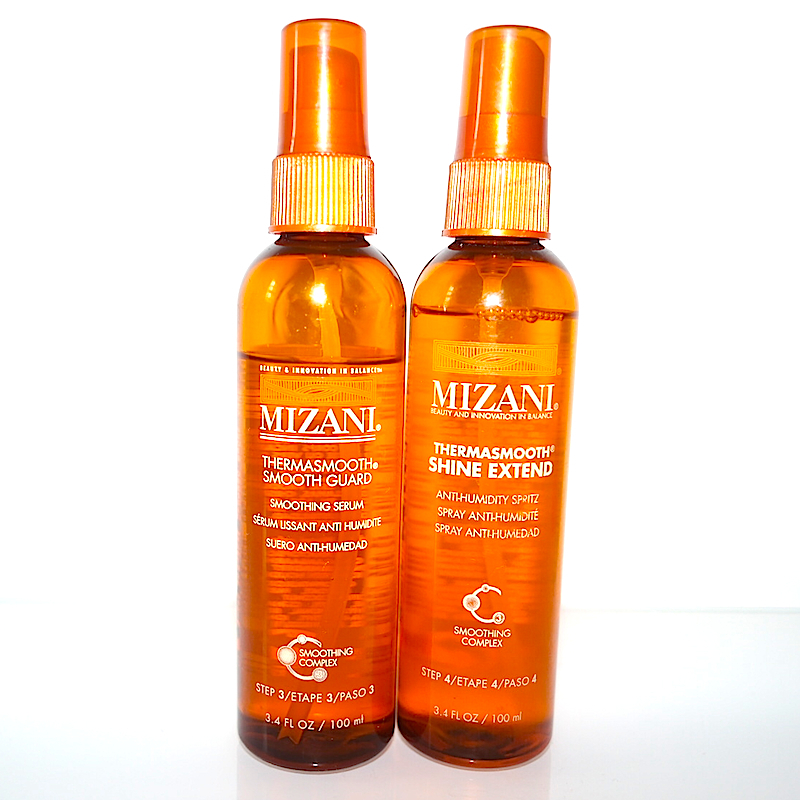 The MIZANI Thermasmooth Smooth Guard Serum and Shine Extend Anti-humidity Spritz are priced at £12.90 each. The products are available at MIZANI appointed salons. For more information please visit their website.